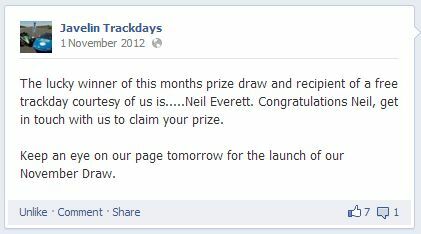 In October 2012 I entered the monthly prize draw on the Javelin Trackdays Facebook page. Not normally one for entering competitions, this seemed easy enough to do (a few mouse clicks) so I went for it, never expecting to hear anything again. I had to use the freebie within 6 months, and given the Mojo was off the road at the time of winning the prize, I went looking at what was on the calendar for April 2013. Cadwell Park is one track that I had never been to, but had heard Jeremy Philips (of Sylva) rave about in the past, so decided it had to be worth a go. The fact that it was one of the more expensive trackdays on the calendar only made the prize more worthwhile! Having got the Mojo back on the road in January with its new engine, I had my work cut out getting the car mapped on the road so it was in a good state for going on track. It all came together a couple of weeks before the event, with me settling on a map which seemed to work with the new engine. For the week before the event I was eyeing up the weather forecast, hoping that the day would not be spoilt by bad weather. It is a fair journey over from Warwick, and I don't have the luxury of a trailer, so the Mojo would have it's work cut out for the day. As it happened, when the morning came, it was dry, and continued to brighten towards lunchtime. The journey over was uneventful, as were the driver briefing and noise test (phew!). So, it was out on track for the sighting laps to get to know the circuit. The track has a 2 distinct characters, with the open swoopy section from Coppice to Chris Curve, and the tighter twistier section from Gooseneck to Barn. I had heard about and seen pictures of 'The Mountain' before, but still wasn't quite prepared for just how steep it is in reality! I enjoyed some great sessions out on the track. The only mechanical issue all day was a wayward outer CV joint boot, which meant a liberal coating of black grease on the wheel and suspension. However I was lucky enough to be able to borrow a trolley jack and boot clips from some friends who were running their own car, and had the capacity for a rather larger box of tools than I had managed to bring! Jeremy Philips also popped over for a while in the morning, Cadwell is practically on his doorstep, and it was good to catch up - even got an invite back to his place for a chat and a cuppa later in the day. Later in the afternoon we got the first signs of some rain in the air. It didn't initially amount to much, but as tiredness started to set in, and the journey home loomed, I decided to pack up and head for home (via the aforementioned cuppa at JPs!). Once on the way, the rain really started to set in, so I arrived home feeling rather damp... but happy!